We are currently hitting the below 0°C in the Northern hemisphere and down jackets are a must during such weather. The wind has been quite awful, as well and in combination with the low temperatures, it is certainly no joke. For some of us winter means staying home, wrapped up in a cozy blanket, whereas to some, it’s the perfect season for outdoors activities. To those of you who continue to remain active during this weather, we have a great jacket that you should take a look at. 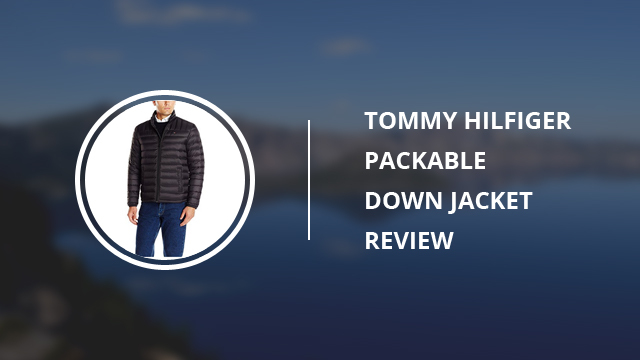 Yes, it is indeed time for another review article and today we will be taking an in-depth look at the Packable Down Jacket for men, by another well-known brand, Tommy Hilfiger. Tommy Hilfiger is an American brand, founded in 1985, by Tommy Hilfiger and it has since then become renown for their high end apparel, based on the “classic American cool style”, as their bio states. They design sportswear for men, women and kids, as well as denim, shoes and accessories. Nowadays, they are continuously expanding their featured designs, to not just apparel, but also fragrances, watches, eyewear and even home furnishing, making it a brand from which you can have a well-rounded wardrobe and be fully accessorized. What else to look for? The down jacket in today’s review is an interesting one, as you will see detailed further down. Not only does it perform quite well in harsh conditions, it is also very easy to store and isn’t bulky, which is sometimes an issue with down jackets. Now, it’s time you see for yourself, so let’s just get right into the specifics. Let’s just start with the temperature it is appropriate to be worn, and we certainly have good news. Tried and tested by those who have purchased this model, it fares quite well in temperatures as low as -10°C (depending also on the person wearing it, of course). You might be thinking that “Well, it is a down jacket after all”, but if you were to see how lightweight it is, this is quite a surprising feature on this jacket. With that being said, this jacket comes in a casual design, meaning that it makes a good daily jacket during the freezing temperatures, or for those who prefer a less bulkier option throughout the winter months. This is a normal fit design and hip-length, making it a good option for those who are active during the day and don’t want to be hindered by having to zip up and down a long jacket. There are two side pockets, lined on the side, to quickly warm up the hands, especially if you are not a fan of gloves. The cuffs are elastic, insulating the jacket from cold and wind. By now, some might be wondering about the name of the jacket and what it actually means in regards to the design itself. It is called the Packable Down jacket, because it comes with a drawstring bag, where the jacket can be kept when travelling or when not wearing it. 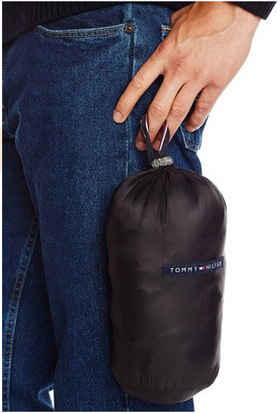 This is an especially good feature, because it allows you to travel lightly, while still having a quality and actual down jacket with you, without having it take up too much space. Since we know that some of you work outside or need a jacket to wear for work and large, bright logos are not allow or preferred, there is good news about that, also. Except for a tiny logo, with the brand’s colors, on the left upper chest, there are no other logos on the jacket. This design is hoodless and comes with a medium-height, stand-up collar, which should be kept in mind if you will be dealing with rainy or snowy weather. 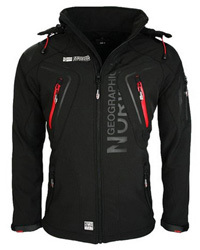 For the outer shell, this jacket is made of 100% Nylon, making it windproof and water-resistant. The inner lining is made of Polyester and it has a padding of 90% duck down and 10% waterfowl feathers. It is a quilted jacket, with horizontal and vertical quilting combinations, placed on the sleeves as well. 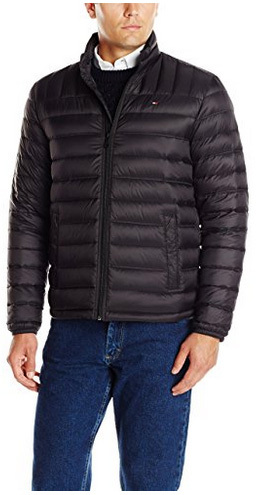 This makes for a good distribution of the down filling, which keeps the jacket warm and well-insulated, making sure that you will be protected against the cold. 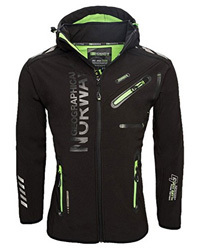 The main zipper is waterproof and it is concealed but comes without a covering placket. Not to worry though, as it has a back placket, which adds some more protection. The filling is quite full, despite the jacket’s light weight and non-bulky appearance, and the inner lining is highly breathable. This is a feature that comes in handy to those who are active or those who are met with warmer conditions while wearing the jacket, as it will not overheat in mild temperatures. And lastly, another good quality to mention for the material combination and filling distribution is the warmth it provides as it allows you to dress lightly underneath and not having to put on layer after layer in order to be comfortable. Despite the Nylon shell being adequate at fending off rain and snow, we would like to remind you once again that this is a jacket best suited for dry weather or mild raining. This is also as a cautionary step, because Down is quite notorious for its issues when it gets wet. And because no one likes a high maintenance jacket that requires specific washing or intricate caring routine, this is a machine washable one, which dries fast and maintains its fullness. Typically, with heavy winter jackets and especially down ones, color selection is quite limited, to usually more classic colors, such as Black, Olive, Brown or Blue. 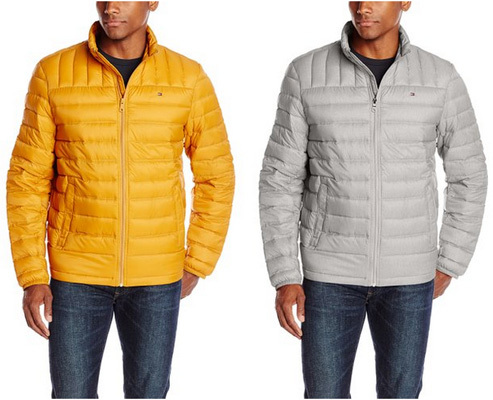 That is not the case with the Packable Down jacket, as it comes in more than ten color options. They are all toned down colors, in beautiful shades and so easily combined that you might be coming back for seconds. The classic colors included are: Black, Cross dye charcoal, Navy, Merlot and Olive. The other colors are varied and more modern, which include: Gold, Red, Royal blue, Ice, Port, Heather stone and Grey plaid. These are colors which go well with most outfits, but if you are looking for a jacket to wear to work or prefer a more refined look, you can’t go wrong with the classic colors. If you would like to switch it up a bit and add some color to your overall look, then definitely check out the more modern ones. We would like to get one thing cleared up first, as you might encounter it among the reviews. It is about the down filling flying around (no pun intended). Many people are not fans of it happening, but what you should know and some of you might already know, down and feather filling tends to bleed down after a while. 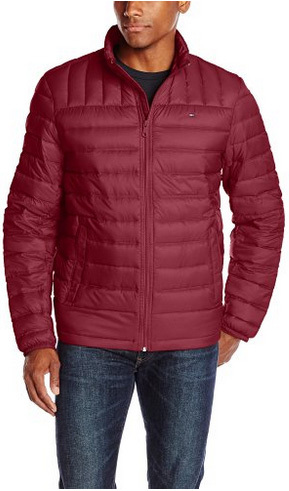 For this jacket, it is not excessive, nor is it any more than it typically happens with other down products, and it is in no way an indication of the material’s quality or a problem with the design itself. With that out of the way, it is now turn for the opinions of those that have put this jacket under different circumstances and have worn it in different weather conditions. Because it is a winter jacket and warmth is its main purpose, we are starting with that first. All of the reviewers agree on how warm this jacket remains, even while wearing it for long hours and in temperatures below 0 degrees. 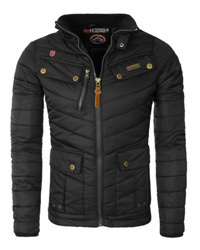 What is surprising to most of the reviewers, is this jacket’s light weight and comfort while worn. It is a surprise because wearing it and seeing how much warmth it provides, it compares to the typical thick, down parkas and for it to come at less than half the weight of them, is certainly a plus. Another plus on this regard is that it can be worn with barely any layering underneath, just a sweater would be enough and you are good to go. When it comes to insulation, the down filling does a fantastic job at maintaining the warmth for hours and not allowing any of the coldness to get through. The design, style and color selection are another thing commented by many. Some of them even plan on ordering a second one, because not only it is high quality and performs great as a down jacket, but because it looks just fantastic in person. It has a stylish look, without being too “out there” and looking out of place with the rest of the outfit. Because it is a packable jacket, of course we’d be including comments on that regard. It packs neatly in the bag it comes with and it is quite easy to carry in the suitcase or even backpack. It doesn’t take too much space and it can easily be rolled up and stuffed into its bag. A couple of reviewers have also worn this jacket at around 15°C, without any discomfort or overheating issues, as it is quite breathable and adapts nicely to different temperatures. As for the wind resistance, the words “amazing” have been used by reviewers. 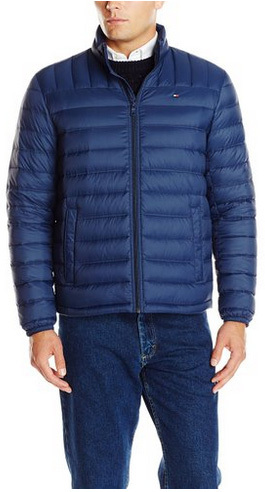 For those visiting high altitude areas or windy ones, this jacket has your back. And lastly, for its water-resistance, as we mentioned previously, users also comment on its ability to withstand rain and snow to an extent, but it’s best suited for dry weather. 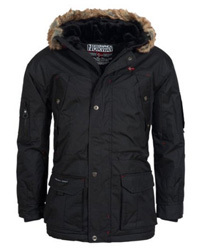 There was plenty to say about the Tommy Hilfiger’s Packable down jacket, but in short, whether you are looking for a travelling jacket, one to wear to work or just a good and lightweight winter jacket for daily wear, which won’t weigh you down and can be easily stored away, then this is definitely the jacket for you.